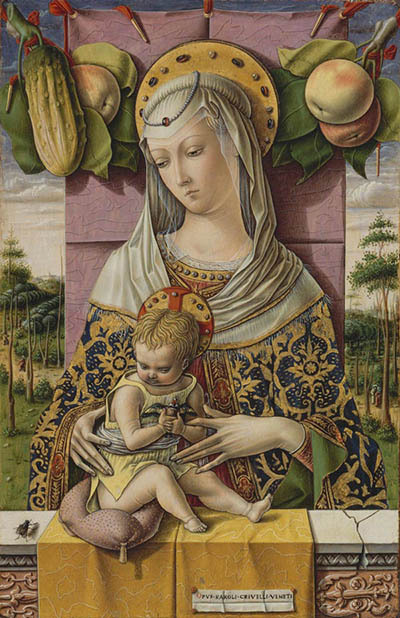 Crivelli's The Virgin and Child (1480) shows his signature device: a cucumber. Carlo Crivelli (1430 or 1435 to about 1494) is one of the most important, but historically neglected, painters of the fifteenth century. He manipulated the surface of each painting with rare mastery of the medium, crafting visionary encounters with the divine, forging the modern icon, and offering a powerful alternative to new models of art associated with Florence. Crivelli produced the majority of his paintings in the Marches, a region of northeast Italy. This exhibition expands our understanding of the “Renaissance” beyond Florence and Venice and explores the work of this technically gifted – and tremendously ambitious – artist. Carlo Crivelli was esteemed in his own time as a painter of status. Born in Venice, he trained locally and joined a workshop in the mainland city of Padua, learning from the same master who taught the celebrated Andrea Mantegna (1430 or 1431 to 1506). In 1457, Crivelli was exiled from his native city for adultery and embarked on a peripatetic career. 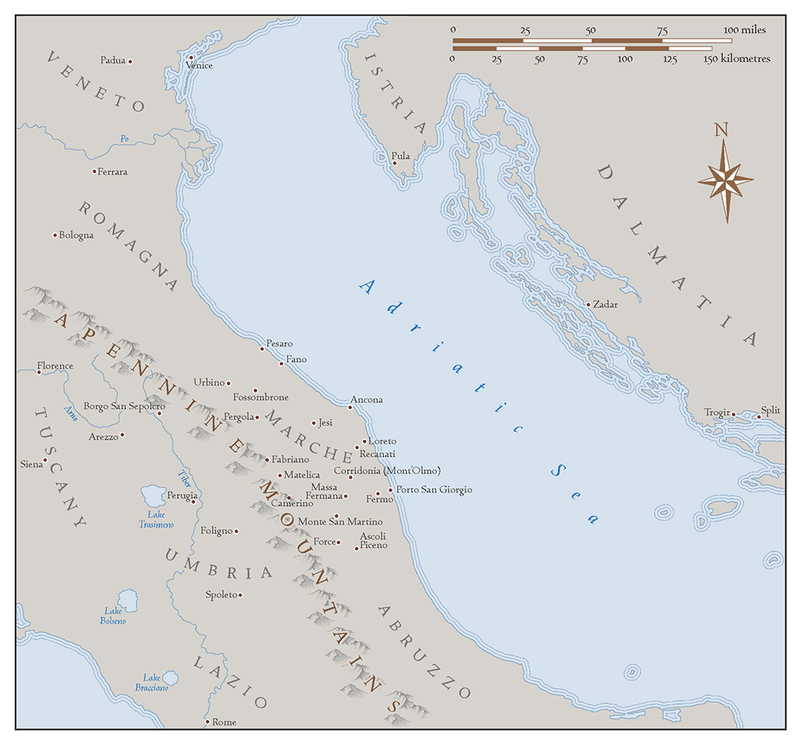 Early successes on both sides of the Adriatic led to some of the most important commissions for deluxe devotional paintings in the Marches. Crivelli signed the immense high altarpieces for the cathedrals of Ascoli Piceno, in 1473, and Camerino, around 1490. Recognized for his accomplishments with the aristocratic title of “knight,” he died around 1494. All the paintings in this exhibition are by Carlo Crivelli and depict religious subjects. Many bear his signature. Crivelli paid close attention to his identity, inscribing paintings with versions of CAROLUS CRIVELLUS VENETUS (Carlo Crivelli of Venice). The painter capitalized on his birthplace by soliciting comparison with art produced in Venice, a city renowned for its creative preeminence. His relentless aspirations are emblematized in the cucumber, an extremely unusual signature device. Crivelli rendered this protuberant gourd with astonishing presence, demanding recognition and urging viewers to admire his artistry. 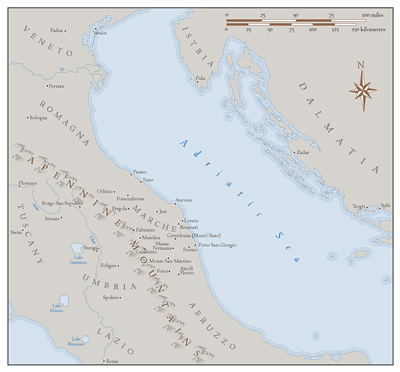 Map of the Adriatic basin, including Venice and the Marches. Copyright © 2015 Isabella Stewart Gardner Museum. All rights reserved. Exhibition support is provided by The Gladys Krieble Delmas Foundation, The Samuel H. Kress Foundation, Robert Lehman Foundation, The Andrew W. Mellon Foundation, and the National Endowment for the Humanities. The museum receives operating support from the Massachusetts Cultural Council.